With the proliferation of playwrighting courses around the UK, be they at universities or subsidised theatres, there’s been a growing scepticism about the notion of teaching playwrighting. Since young writers’ groups serve as the most obvious entry-point into the profession, it’s hard to find a self-taught playwright under 35 these days. However, if everyone’s taking the same courses, the danger is that every play starts to look much the same. At the same time, the success rate of such schemes has been undeniable. 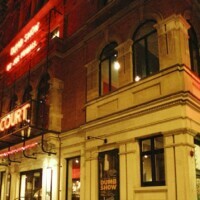 A look at the Royal Court shows a steady influx of trainee writers into its main programme: Polly Stenham, Nick Payne, Anya Reiss in recent years; before them, Lucy Prebble, Laura Wade, Mike Bartlett – and the list just goes on and on. Go back far enough, in fact, and you find Leo Butler, who took over as course leader in 2005. He inherited a two-tier system – the Young Writers Programme for nascent playwrights and an invitation group for more experienced writers. To that, Butler added the jokingly titled Supergroup; a longer-term course (25 weeks) for playwrights to whom the theatre wanted to commit. Five years earlier, he’d joined Hanif Kureishi’s invitation group, which was “very laid back: we drank pints, smoked cigarettes and talked about books and plays.” It all sounds like a throwback to the first incarnation of the Court’s writers’ group in the early 70s, a politically-motivated gathering known as The Activists. Both Macmillan and Butler agree that playwrighting isn’t a syllabus-led subject. However, there is a skeleton of crucial points to cover: “scene structure, story structure, character, dialogue and form,” says Macmillan, “Form, being the one that often gets missed out.” The aim is to flag up “the things that first-time writers often get wrong.” However, over-emphasize these principles and you wind up with conformity and consensus in the resultant work. The key, both stress, is that there are no rules, only what Macmillan calls “lightbulb moments;” everything needs be up for grabs. For Butler, any group of writers will naturally tend towards a variety of work, but to do so, they need shepherding away from the power of example – whereby writers adopt the traits of successes and theatres seek to programme similar work. Once it was Sarah Kane knock-offs, now it’s Simon Stephens stylee. If there’s conformity in work on stage, Butler argues, its more likely down to “the tastes and temperaments” of programmers.